The count down is on. 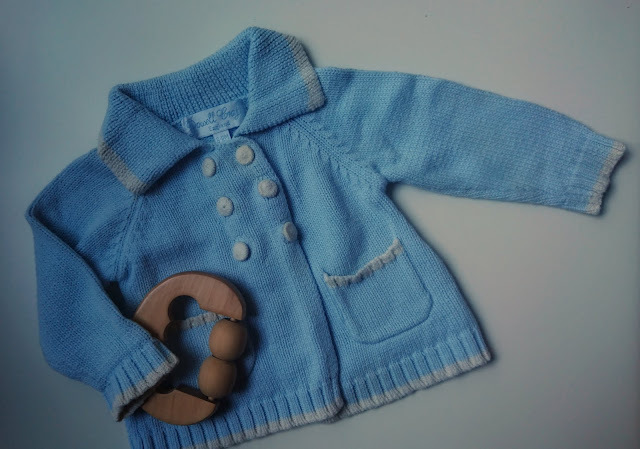 There will be less than a month before this baby comes and I am feeling excited but slightly terrified! Baby- At 34 weeks baby should be measuring up to be around the size of a cabbage (45cm) in length and will be weighing in at around 4.7 pounds according to my pregnancy app. We have had a growth scan this week and baby is actually estimated to be 5.2 lbs now so he's doing well and still has time to gain more weight. Although the lungs are still developing they are almost there now and will soon be developed enough to breathe air after they are born. Now baby can also hear much better. His hearing is developed enough that he can hear. He will respond particularly to high pitched noises. Something I can confirm thanks to Scarlet's high pitched screech always getting a reaction. Another interesting fact this week is that baby will have fully grown finger and toe nails now. It's a little strange to think there is baby nails inside my stomach! Me- I'm really feeling the effects of being heavily pregnant now. I'm tired and most days I find I do need to take a nap, usually I lay down at the same time as Scarlet and have a nap while she does. I still wake every night needing to use the bathroom or simply because I am uncomfortable. I'm now finding it hard to get comfortable anywhere, walking, sitting or laying down all have me needing to change after a short time. Towards the end of this week I woke up feeling awful. I'd had a long night of waking up with a sick taste in my mouth and I felt pretty sick. Thankfully it passed through the day and was almost gone the next day. I'm hoping it doesn't come back. As I mentioned above we had my 34 week appointment this week. I have to say I've never had an antenatal appointment like it. It went awfully and I am sure it was due to my over stretched hormones, feeling sick and the poor staff who already have a whole room full of pregnant women to deal with. However I was made to feel like I was unreasonable for questioning why I hadn't been seen at all in close to an hour. So when I did make into the doctor at an hour and a half after our appointment time to be told I didn't have Obstetric Cholestasis, that I was taking more medication than the maximum dose and have been for almost 10 weeks on a daily basis. I lost it! I wasn't being listened to and I was being told to go look it up on google and find out more. Which of course I did do well before this appointment, in fact having been through it all before I had researched a whole lot during my last pregnancy. I cried and after a few minutes I made my way to explain everything that has happened. In the end we spent over 45 minutes talking to the doctor who I probably made feel awful and burdened with all the things that had happened at our previous and current appointment. 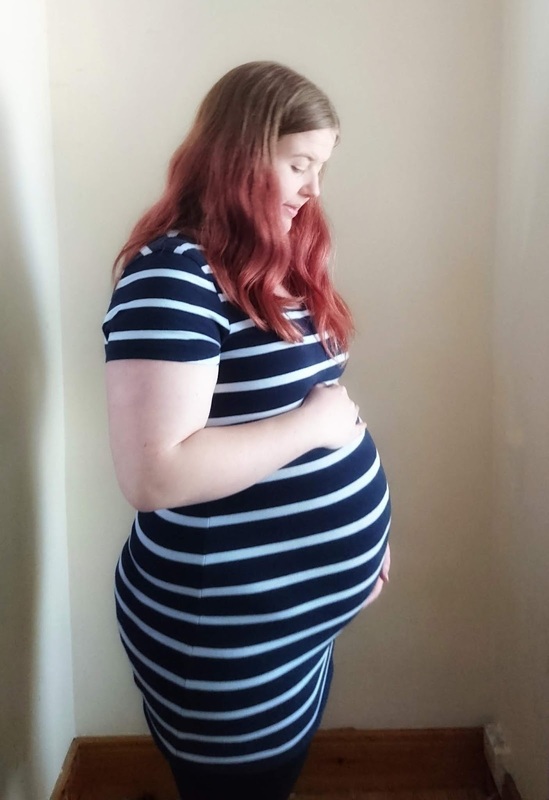 However she was fantastic and she did sort it all out, in the end we worked out what I need to be doing, what needs to happen over the coming weeks and we went through all my previous pregnancies and labours. I asked her all the questions I needed answers for and she booked my induction date. Although she does think I may well go into labour on my own before then. 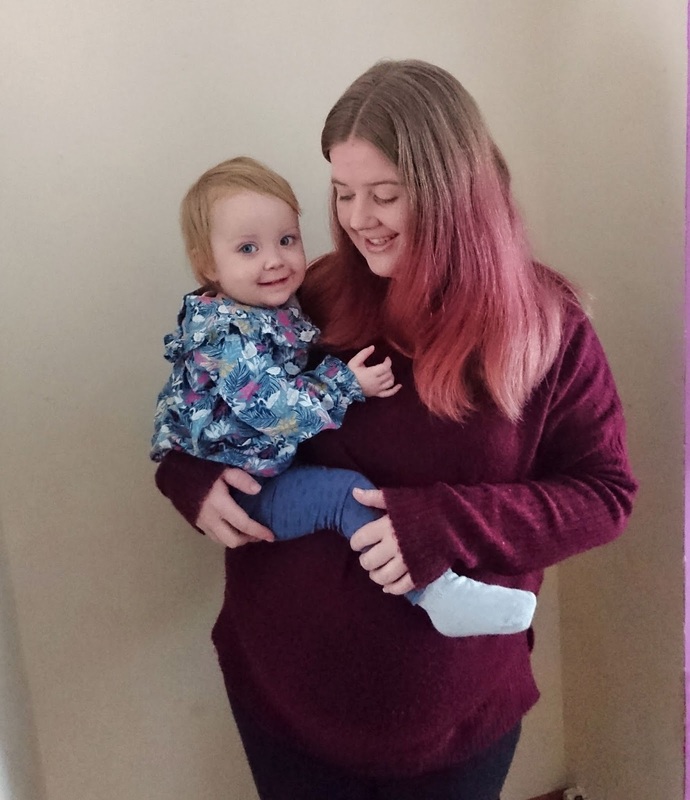 She explained the induction process, told me all of my options and all the facts I need to know about Group B strep which I had during my last labour but went undetected until after I had given birth. We then booked in for another growth scan in two weeks time and I honestly left the hospital feeling so much better. I do feel a little guilty that I just burst and all my frustration with the information constantly changing came out on this one doctor who was really just trying to help and do her job. She did reassure me and we left on good terms. I apologised for my outburst and I thanked her for helping me with everything. Hopefully next week won't be as eventful with Easter break about to start and a to do list as long as my arm needing done before it's time for this baby to join us. Confession time, I forgot to get a bump shot for 28 weeks. A fair bit happened and it was just put off while there was other things going on. Baby - This week baby is measuring up to be around the size of a cantelope melon (37.6cm) and weighs about 2.2 pounds! We're now at the stage where anyone who puts their ear on my bump might be able to hear babies heartbeat. Scarlet loves to give the baby bump cuddles so I think she might now be able to hear his heartbeat. Now baby should be able to smell. He'll be able to smell the same things inside as I can! How cool is that? Baby should now be able to see my face when we are breastfeeding. His sight has gotten that good already. He can also blink. Another huge milestone is the area of brain thought to be responsible for consciousness is starting to become active. Me - I'm still suffering really bad with heartburn and acid reflux. It's there most of the time now. Thankfully ice pops and Rennie have been getting me through, I'm hoping it'll dissipate a little as time goes on. Now that I'm in the third trimester I'm finding it harder to stay asleep at night. I'm okay getting to sleep but I'm already waking 4+ times a night. Between being uncomfortable and needing to use the bathroom I'm getting less and less sleep. It would usually have been around this stage in my previous pregnancies that I would use my pregnancy support pillow. However it was one of the first things to go after having Scarlet. My bloods continued to be on a Friday last week and I knew before they'd even taken them that it was back. My bile acids had jumped up to 15 so not the astonishing 111 they jumped to when I was pregnant with Scarlet but it's still three times the normal level. 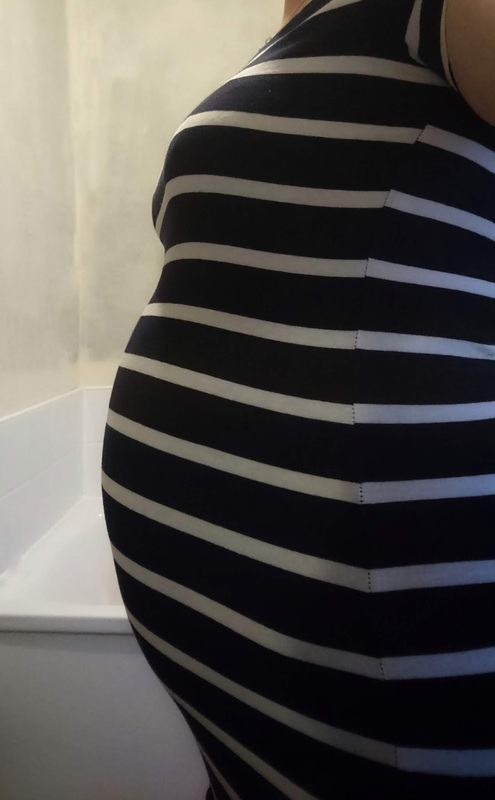 So as things stand I have Obstetric Cholistasis. I'm on the medication to try and help control my bile acid levels since the third trimester is when this condition is considered it's most dangerous. It also means we won't be reaching 40 weeks in this pregnancy either. So far this week the itch has stayed the same. This is around the time I wrote my last bump update with Scarlet. 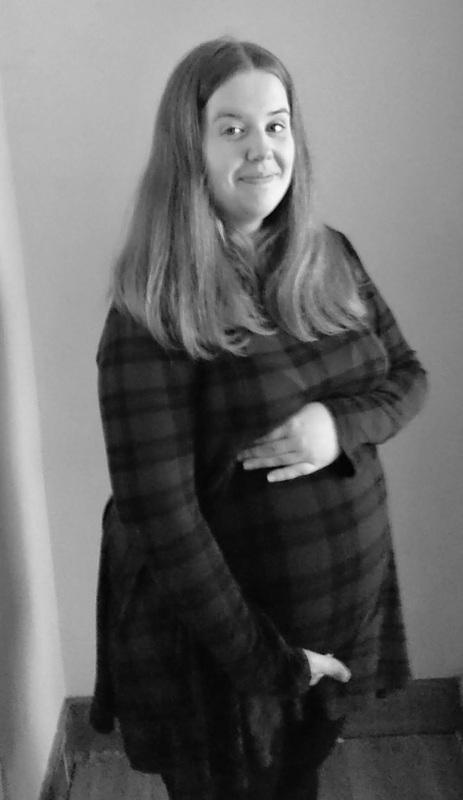 It wasn't intentional and although I went on for a further 7 weeks of pregnancy it was a time when I was spending more time at hospital in preparation for her arriving. This time I want to make sure we keep going through to the end. Baby- Around now our little boy is around the size of a cauliflower (38.6cm) and weighs in at around 2.5 pounds. Now that baby is putting on more fat their skin is starting to smooth out. At the same time the white covering (Vernix Caseasa) that has been protecting his skin is starting to disappear. The hair (lanugo) which has covered baby is also starting to go. It's amazing to think that by the time I give birth he'll be more than double his current weight! Me- I'm very aware of how little time is left of this pregnancy. There will be less than 9- 10 weeks before we have a baby. Which is crazy! I've hit my nesting already. I'm organising, cleaning, clearing and preparing for the baby anytime I have some extra energy. I'm still struggling to stay asleep at night which is having a knock on effect. Having two children to keep up with which growing another is certainly not easy! I don't think the fact I am struggling to eat a proper meal now is helping. As baby grows my stomach is getting smaller which is perfectly normal however I am just not getting very hungry other than at meal times. I managed to have my fasting bloods done twice this week. The usual Friday appointment saw them double despite me now being on ursodeoxycholic acid to try bringing them down. My appointment was moved up to be on Tuesday. However come Tuesday evening I'd got a call and had to go up to the hospital and speak with a doctor. I've now had an extra dose added on every day and we're around half way between normal and what is considered to be really dangerous levels. It does mean that I'm going crazy with itch and I now very vividly remember just how bad this was in my last pregnancy. I'm really hoping that from here on out they'll start to drop. Bath time is always an exciting time in our house. Both Dylan and Scarlet love getting into a bath filled with bubbles to splash around and have fun. Over the last few years we've loved using Infacare Baby Bath and InfaCare Night Time Baby-Bath products with both children. Both the InfaCare Baby Bath and InfaCare Night-Time Baby Bath are perfect for use on babies skin which is ten time more sensitive than an adults. This is why it's so important for InfaCare's products to be ultra mild and PH balanced. That doesn't mean you'll have to compromise on bubbles though! I've raved on many occasions about the vast bubbles made by both InfaCare Baby Bath and InfaCare Night-Time Baby Bath. They are sure to withstand as much bath time fun as your baby or child wants them to. The great news is that thanks to the gentle and natural make up of InfaCare Baby Bath and InfaCare Night-Time Baby Bath it's even recommended by midwives and health care professionals. In fact both of them have been clinically tested and proved to help promote the skin and hairs natural acid and alkali levels. It helps parents to relax and enjoy bath time with their children while knowing their skin won't be affected. The newest of the duo InfaCare Night-Time Baby Bath is well loved for it's added quality of a soothing scent. This soft and delicate aroma helps to soothe baby at night time which makes it the perfect addition to your bedtime routine. The scent is subtle but so very effective and perfect for small noses. 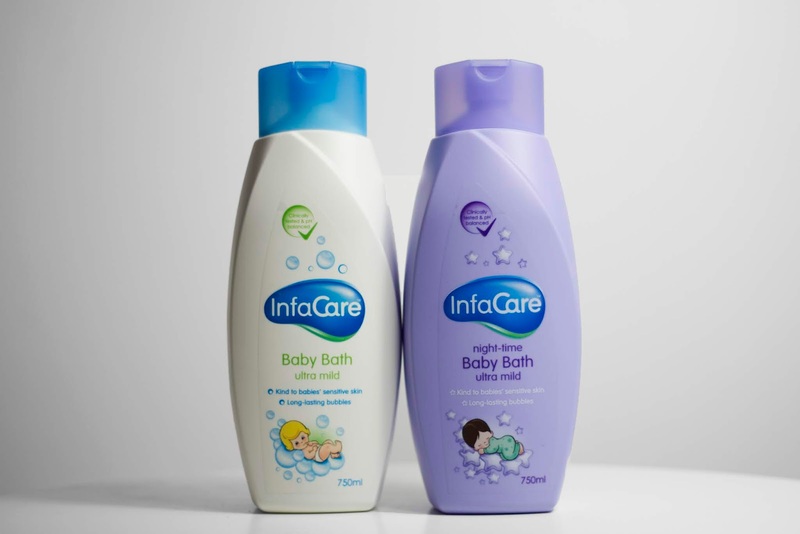 InfaCare Baby Bath (RRP £3.00) and InfaCare Night-Time Baby Bath (RRP £3.50) , Boots, Co-op, Lloyds Pharmacy, Sainsbury’s, Tesco and Wilkinson. To be in with a chance to win the duo enter using our Gleam widget below. Entry into this competition confirms your acceptance of these Terms and Conditions. The winners will be selected at random from all the correct entries received before the closing date and time (28 March 2019, 23:59). The prize will be sent directly from the PR. Baby - Our little boy is already measuring up to be the size of a broccoli head (36.6 cm) and weighs 1.9 pounds. He's got around 15% body fat right now but by the time we reach his due date this should double to almost 30%. Around this time baby is starting to open their eyes for the first time and it won't be long before they can tell the difference between night and day. This week babies brain will be in the final stage of developing at an incredible rate. It's not the only thing either, he's now got taste buds too! It's now that his little lungs are starting to practise breathing using amniotic fluid so he's ready when the big day comes. Me - It's official, I can no longer climb to stairs without great effort! It's not only the stairs that make me need to pause or slow right down now, hills, ramps and any other upward walking can pose a challenge. I'm used to running up and down stairs several times a day so getting used to going slow is kicking me up a little. Trying to climb our stairs in the evening while holding Scarlet is much harder too. Think trying to climb a mountain carrying a large rucksack! This week has been crazy! My usual fasting bloods got pushed by a day so I could have them done alongside my Glucose Tolerance Test on Friday morning. The orange flavoured drink used in the test made me feel awful right from the start and my heart was racing the whole two hours I was sat waiting for the test to end. It took hours after the test had ended for my body to feel more calm again. Come mid- day I really needed a nap and afterwards I felt normal again. Come Sunday I caught a bug that Scarlet had suffered with on Friday and for the first time in this pregnancy I threw up. I spent the entire day asleep, mostly in bed alone. Thankfully it only really lasted for 24 hours and by Monday I felt more normal. I was still a little drained so we've taken it easy over half term and rested up. We did have a growth scan this week a growth scan this week which all came back as normal so baby is growing perfectly and is healthy. I spoke to the doctor about being tested for Strep B this time around and what we will be doing. 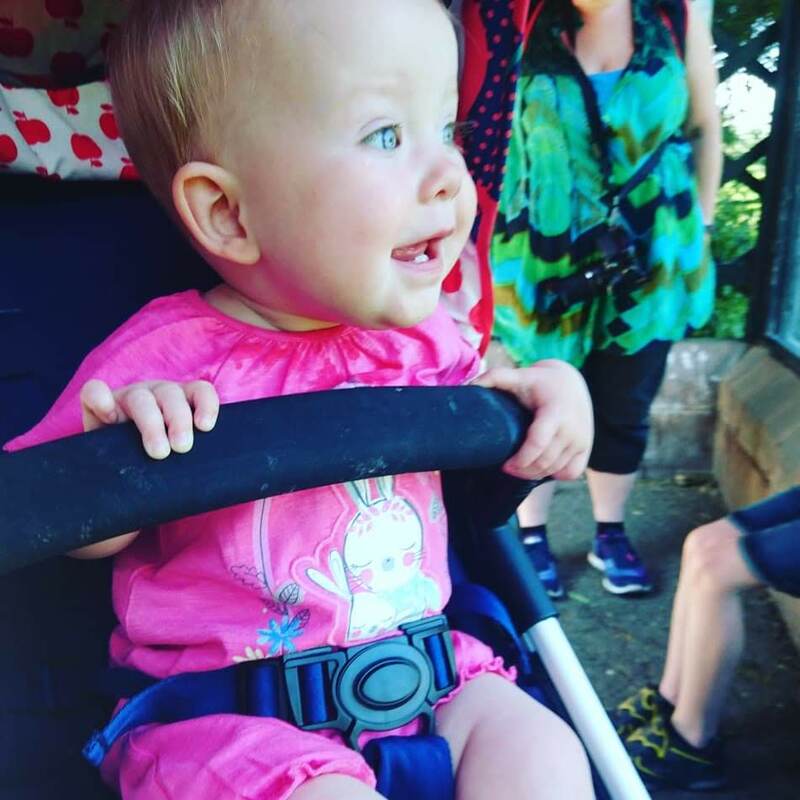 We had been very lucky and Scarlet didn't get Strep B which was only discovered in a test result that came back after I had given birth. This time around we will be armed with the information we need to protect baby should we need to. The test will be done in about two months time and we'll have options once we have the results. Our next scan will be at 30 weeks in the hospital. It's half term for us and since the weekend has just past we've had a whole bunch of things to do. Which of course means today and tomorrow will have less ideas on what we can do. That is where Zimpli Kids comes in, we've been trying out some new fun games to play with the Zimpli Kids Range. 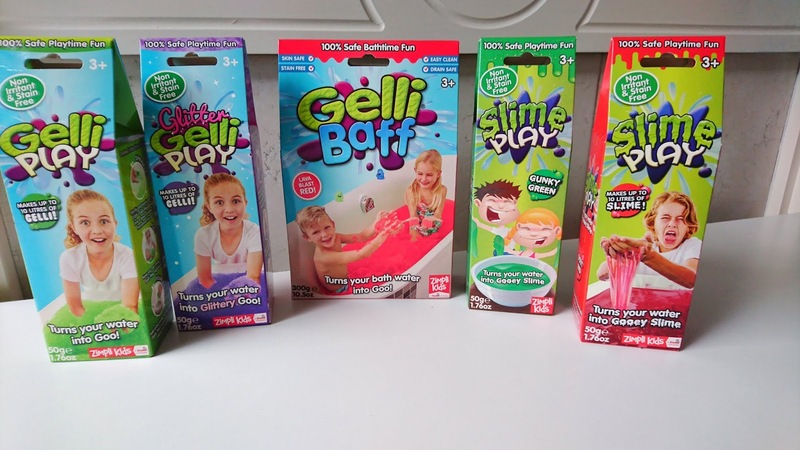 With various products in the range including the Zimpli Kids Slime Play, Slime Baff, Gelli Play and Gelli Baff there is a wide range to choose from. 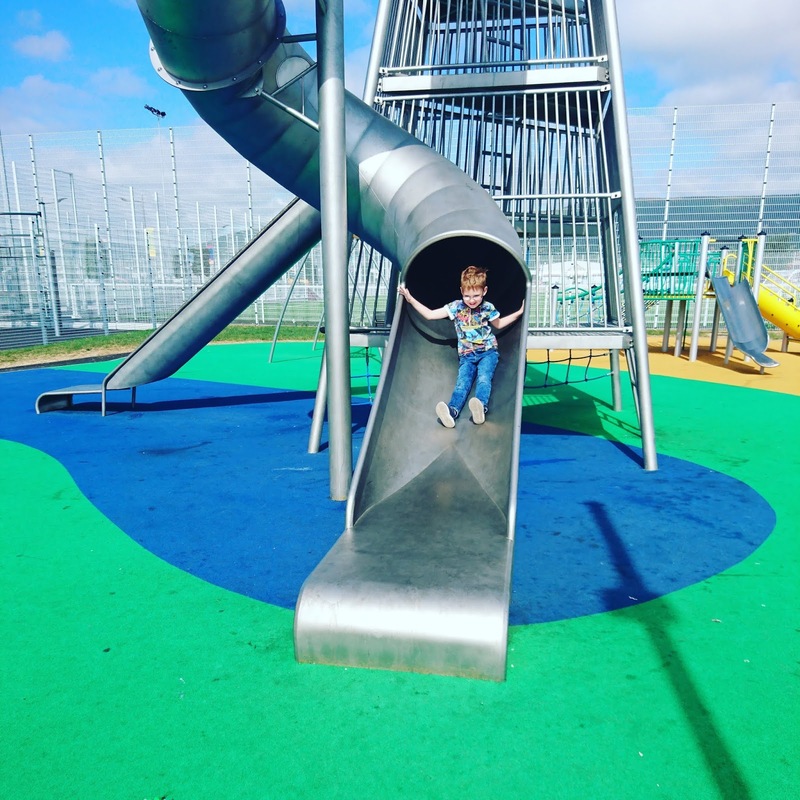 Each has a whole world of fun without adding any extras but we've been testing out new fun and exciting ways to play. As you can see we received a wide range of the products to try out. The first little game we wanted to try out was a game of discovery. Inside a large bowl I made up one batch of the Gelli Play by adding the recommended amount of water (4 litres for the whole bag) and sprinkled the mix evenly over the top. Just leave the mix for 10-15 minutes for it to form up into the Gelli. 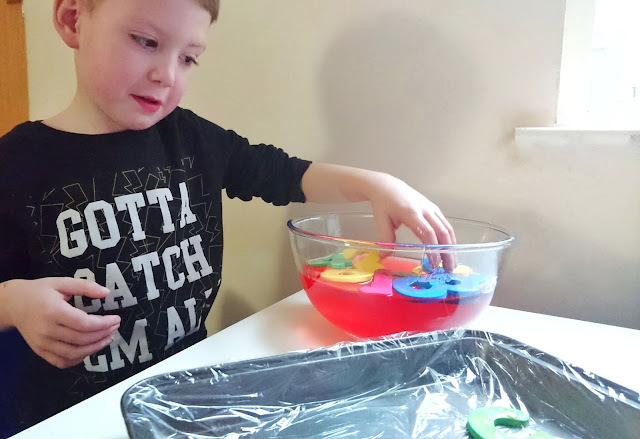 Once I had the Gelli Play ready to go I added in some smaller dinosaurs for Dylan to find and this activity was all ready to go. 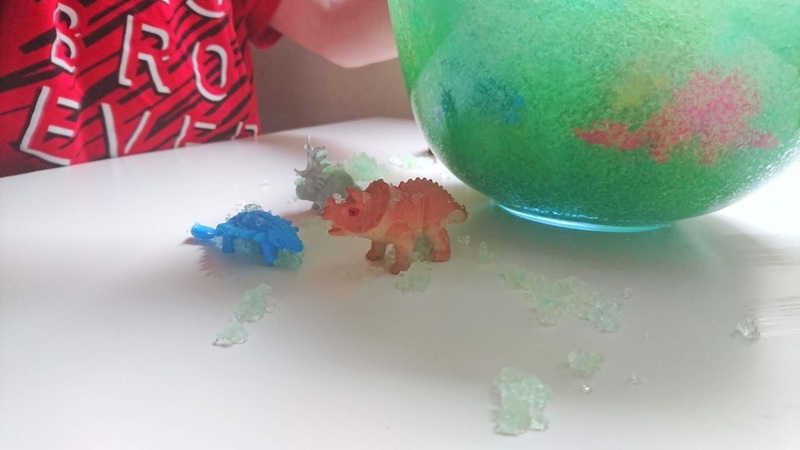 Dylan loved hunting through the Gelli Play from Zimpli Kids to find the dinosaurs hiding inside. 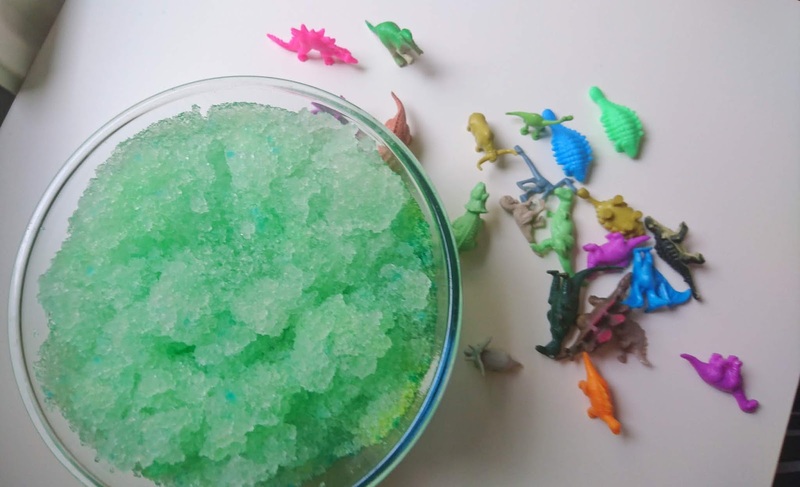 We have done similar activities to this one before with the dinosaurs but I love that the wide range of colours in the Gelli Play means you can create various themes with different animal figures or even with people figures too. The glitter Gelli Play would be perfect for doing a magical or fairy themed play session with. However any little toys that are fit for the bath can be used! This activity brought with it many hours of fun and it's one I would really recommend. 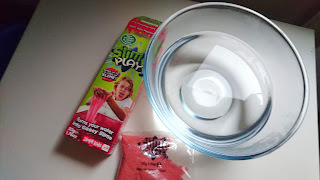 Another great game to play is one which uses Zimpli Kids Slime Play. I choose to go with a different colour from the range when we played this one to keep things new and exciting. 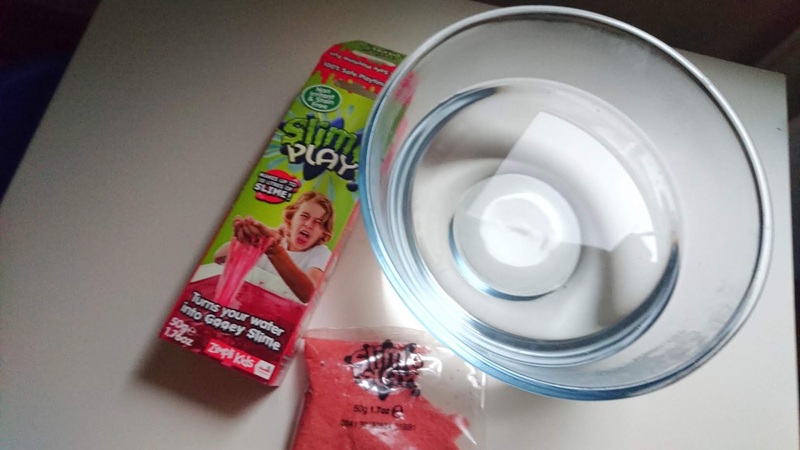 Once again I added in the warm water (4 litres for the whole bag) before starting to sprinkle in the slime mixture. 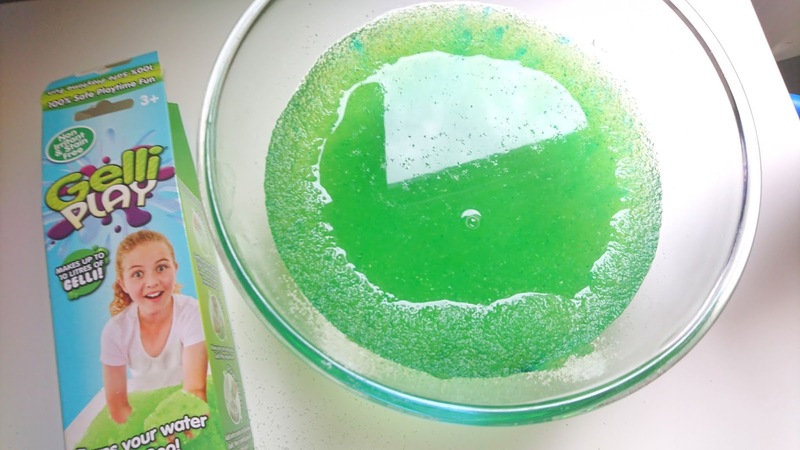 To ensure the slime forms properly you leave it for 15-20 minutes and only stir occasionally. Once the slime has formed add in some foam numbers. 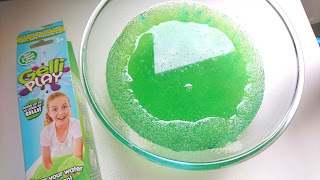 You will also need some sort of tray or plate with this activity. I used a small metal tray covering in a layer of cling film, I added in a plus and equals sign keeping a minus sign to the side. Then it was ready to go. I let Dylan go wild finding the numbers and creating his own sums. We then spent some time working out the sums before popping the numbers back in the slime and starting again. 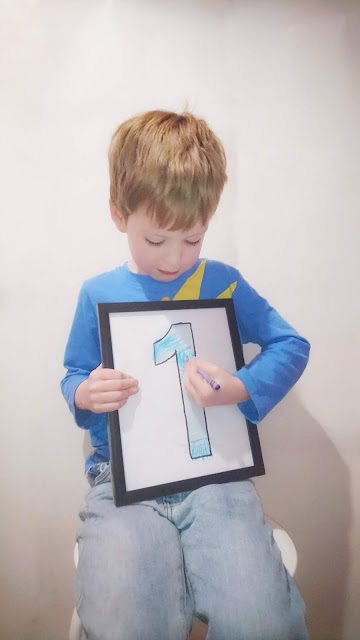 Dylan really loves maths and doing sums so I knew he'd love this one. 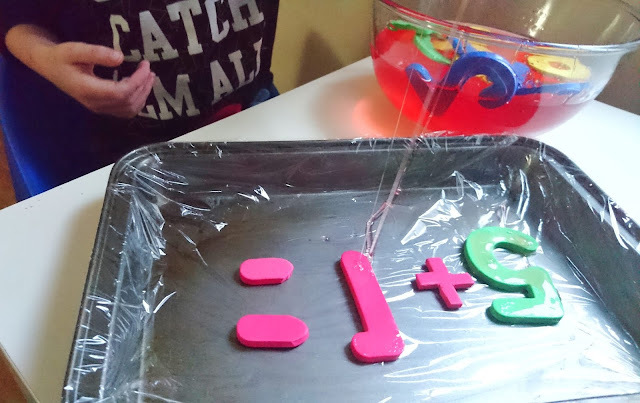 We plan to do this activity again with letters instead of numbers and have fun with spellings! These are great for spicing up homework now and then too. The great news is that both these activities are easy to clean up too. 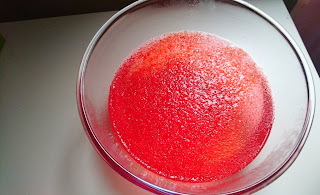 Just add in more water and mix to a water like consistency again. Once back to water you can just pour down the toilet and flush away before cleaning your bowls and toys up ready to use again. 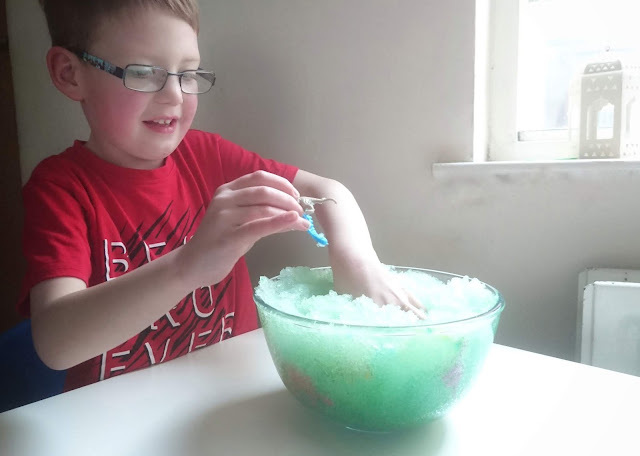 I love that the whole process is easy to do and brings with it so much fun for little ones. You can purchase Zimpli Kids Slime Play 50g (from £3.87) and Gelli Play 120g (from £4.99). 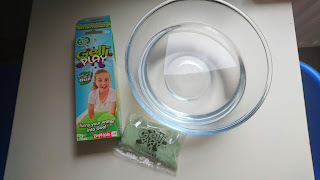 We'll be sharing some more from Zimpli Kids in the next week or two about some more fun to have with Slime Baff and Gelli Baff so do come back and see all about that too. Disclaimer: We received the products featured above in return for an honest review. all thoughts and opinions expressed above are my own. Baby - Our little boy is already measuring up to be the size of a grapefruit (34.6cm) and weighs 1.4 pounds. He can hear much more now and will be able to hear loud noises as well as my voice. If we've been relaxing for a little while and I start to talk I can feel him start to move around in response which is so cute! There is a chance that he can even hear music now so who knows when he might decide to have a little boogie of his own. At this stage baby will also have his own little routine going on inside. He has his own times of wakefulness and of resting. The routine he seems to follow is much more predictable and I'm already aware of his most playful times in the late evenings. Typical that he'll wake up not long after the other two go to sleep. He's so active now I can really see his movements. I've even managed to catch him on camera now! It's this little routine that will stay so important as we head further into this pregnancy so I know I need to be aware of when and how active our little one is. A big change in his routine can be an indication that something isn't quite right. Me - I'm growing by the day! Just five weeks ago I didn't really look pregnant and actually I just looked on the fat side. I really do look pregnant now unless I've got my coat on. I've also officially outgrown my final super stretchy pair of jeans. Life is going to consist of a lot more leggings from here on out. This week I've really noticed the difference in my heartburn/ acid which is getting bad now. I can already tell I'll living with it on an almost constant basis by the end. It was something I really suffered from with Dylan so I'll be stocking up on ice pops now as they really helped then. I've not really been itchy this week. I did have a few episodes at the beginning of the week when my legs itched however it has staved off to only happen once or twice a day. I'm hoping that my lack of itching is a good sign that the Obstetric Cholestasis isn't coming back. Although I am still having my weekly fasting bloods checked. We're already coming up on 25 weeks at this point and we've known what we are having for the last three weeks. Since it was only two weeks ago that we told the world about our little surprise baby we decided that other than our very close family we'd keep it a secret for just a little longer. We wanted everyone to have some time to come around over the shock of the news too. 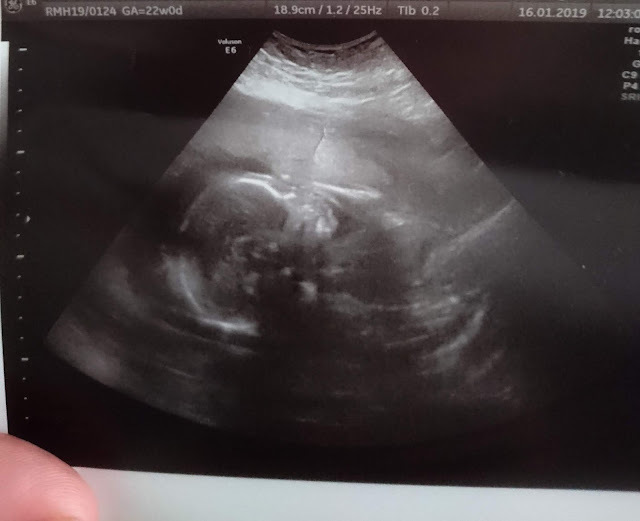 So at our 20 week anomaly scan (at 22 weeks) we found out that we are having another little baby boy! Since it was at our anomaly scan it was just me and Simon, which felt right. It had been just the two of us when we found out Dylan was a girl and it was just the two of us when we found out Scarlet was a girl. It also meant that we could be the one who told Dylan who was eagerly awaiting the news and hoping with all his might that it was a boy. To say he was delighted when he found out would be an understatement! He literally ran down the street. We're very excited to be adding another little boy to our family. It's the end of January and since the start of the year I've started to think about what 2019 will have in store for me. Each year I would make some resolution that wouldn't last a week. Last year however I made a change and instead of making any resolutions I decided to choose a few things I wanted to achieve by years end. I wasn't sure how it would go at the beginning. I didn't set any time frame for starting each but I just made a point of getting what I wanted to do written down. I've taken a look back on my 'In 2018 I will..' post and I'm really surprised that I managed to do almost everything on there! An important aim for me at the beginning of last year was to find time for myself. I rarely found five minutes when I was just doing something for me. Over the space of 12 months I don't feel I've found much time, at least not on a daily basis where I don't have to do anything for anyone else. That said I do think I found some time just for me. Scarlet is older and she's not as clingy as she had been which allows me to find a few minutes to throw on some make-up, drink a hot cup of coffee or watch a video on YouTube from time to time. My other aims included moving the blog which happened in May. 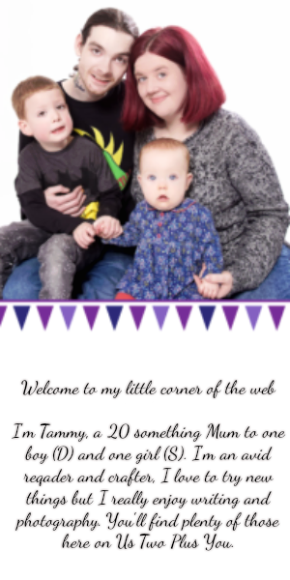 I wasn't sure I'd get there since I had to learn coding, create a whole look, theme and more between our usual posts and two children. I'm glad I found the time and dedicated every spare moment to the move that I had. I love our new home here online and I'm hoping we'll stay here for a long time yet! I'd also planned to declutter our house which although is started, it's more of an ongoing project which I'm pretty happy with. We've probably cut our toy collection by about a quarter, possibly a third and we've decluttered big areas of our lives like clothing, shoes, spaces we used to just keep things we might need and we've sorted through a large portion of baby items from Scarlet which actually happened long before we found out about baby number 3! Finally I had planned to lose weight during 2018 and for the first half of the year I did. I lost enough to drop down a dress size. 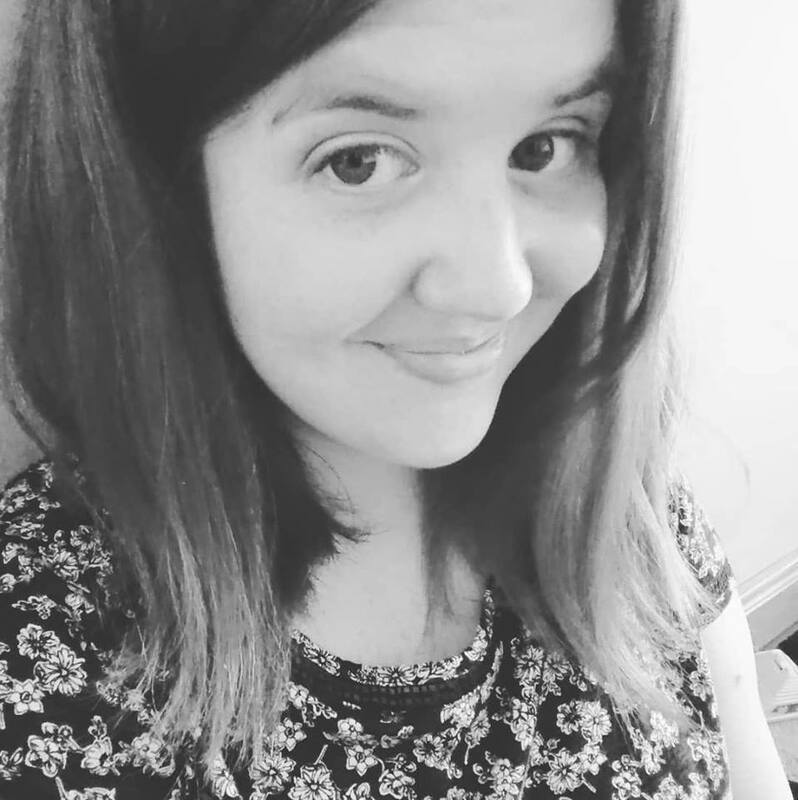 I tried slimming world although that didn't last and I ended up just being healthier about my food choices, cut out sweet treats and ate less carbs. Come the second half I wasn't as concerned about my need to diet or lose weight as much I was with my overall health. I am actually pretty healthy. I get a decent amount of daily exercise and more than the recommended half hour a day since we walk, a lot. Which actually leads me to something I want to achieve throughout 2019. I want to be more Body Positive. In 2018 I came across the Body Positivity Movement, which is all about people who love their bodies, flaws and all because nobody is perfect and we should all be accepted in society. I'm not skinny, in fact the only time I was skinny was in my teen years when I basically didn't eat more than a meal every day. Even then I wasn't happy with my body, I didn't have a flat stomach, I had large thighs (probably due to the muscles my legs needed to drag around a pair of New Rock boots daily) I had bingo wings and I hated it all! As time has gone on I have found that I am more accepting of my body and the way it is despite being pretty healthy. I have got PCOS and unfortunately difficulty losing weight and maintaining a weight is actually a part of that. My body does have it's own 'happy' size which I've stayed around or at since having Dylan 6 years ago without the need to diet or adjust my lifestyle. It's this size which I always go back to after finishing a strict diet but that size is classed as 'obese' for my height. Since I am now over half way through my third pregnancy I'm ready to start being as happy with my body after I give birth as I am when I'm pregnant and growing another human. This year I will be becoming more body positive although I've not yet decided if it's something I will talk about here. Although we do have a routine we tend to stick to there are some places in which I would like to improve our routine. It's mainly around Scarlet's sleep pattern that I would like to try to create a routine which we stick to. In the next two moths both children will go into a room together and Scarlet will have her own bed. Throughout this coming year I would like to find a good routine that works for her and that once the new baby comes we can easily adjust to accommodate everyone. At the minute Scarlet sleep when she feels like it and often she can be still be awake come 10pm or after. So this year I will be trying to start a better sleeping routine and maybe adding in some set times to do an activity with both Dylan and Scarlet each day. If you've got any tips on how to start setting a good routine with a toddler then please do leave me a comment. There are areas in our home which have needed a new lick of paint for a while now and despite our intentions it's always been put off. This year will be different. I am determined to get the whole house redecorated throughout this year. Everything from painting the rooms and giving the children's room a complete makeover to repainting our radiators, skirting boards and even plastering some of the hall. It's a big project and it's one which we need to have mostly finished before May, when I'm due. SO there will be lots of DIY going on over the next several months! We do have weekly times set aside for doing things as a family. We already have a movie night every Saturday evening where we will have some snacks and sit up on the sofa together watching a movie. However I would like to make some extra time each week to have some technology free time. I'm not really sure on if we should create time to do an arts and crafts activity, play a board game or do something different. I may even end up making a jar which we can all add some ideas into and choose one every week. There you have it. This year I want to achieve these four things.It probably won't be easy and I might not do every one in the way I think I want to now however I hope that things will slowly be ticked off as we go along. Having another baby wasn't really on my radar. We'd decided that after the pregnancy problems I'd had with Scarlet we had completed our little family. Fate on the other hand seems to have had a different plan all together. 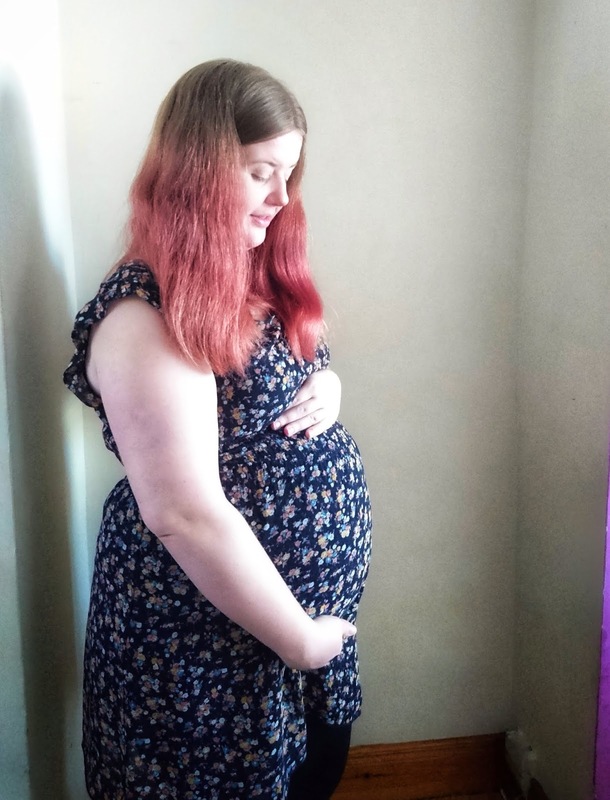 Having previously shared how difficult it can be for me to get pregnant with Polyscystic Ovary Syndrome (PCOS) things like having a regular period haven't happened since my early teens. In fact we'd been actively trying to get pregnant with Scarlet for over two years. 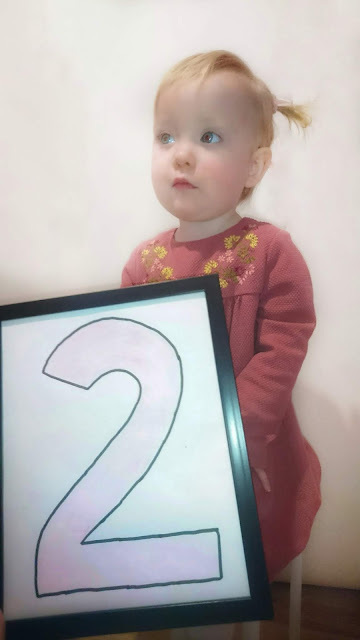 Paired with still breastfeeding Scarlet, I had only had two cycles in the 18 months after giving birth. It wasn't worrying nor was it a big indication of anything for me. My cycle pretty much does what it pleases when it pleases. It always has. So when it didn't arrive I didn't even think twice. Since I was still breastfeeding Scarlet any changes or tenderness usually got put down to that. Looking back there probably was times when it was more about pregnancy tenderness rather than feeding. It just happened at times when I would expect to be uncomfortable. Come Christmas Scarlet had gotten sick and decided she was stopping with breastfeeding. It was only when she refused to feed a few days later but still wanted to be close and try that I started to connect the dots. 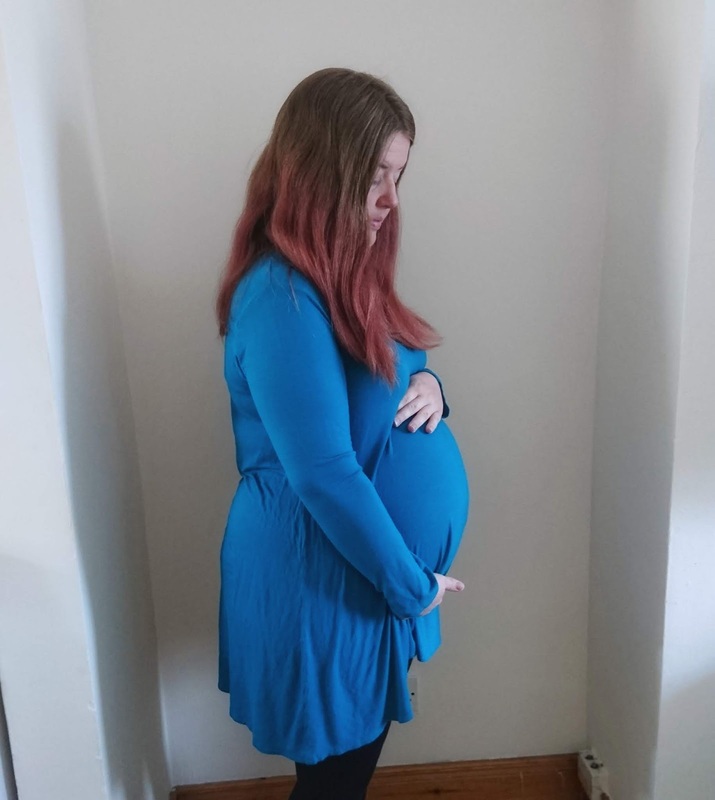 I've been very lucky with symptoms this pregnancy, mostly I haven't had any. I didn't have any morning sickness. I haven't caught any colds or flu's that the children didn't bring home and I hadn't really felt any different. Which is really contrasted in my last two pregnancies, with Dylan I got ill with bugs a lot in the beginning. 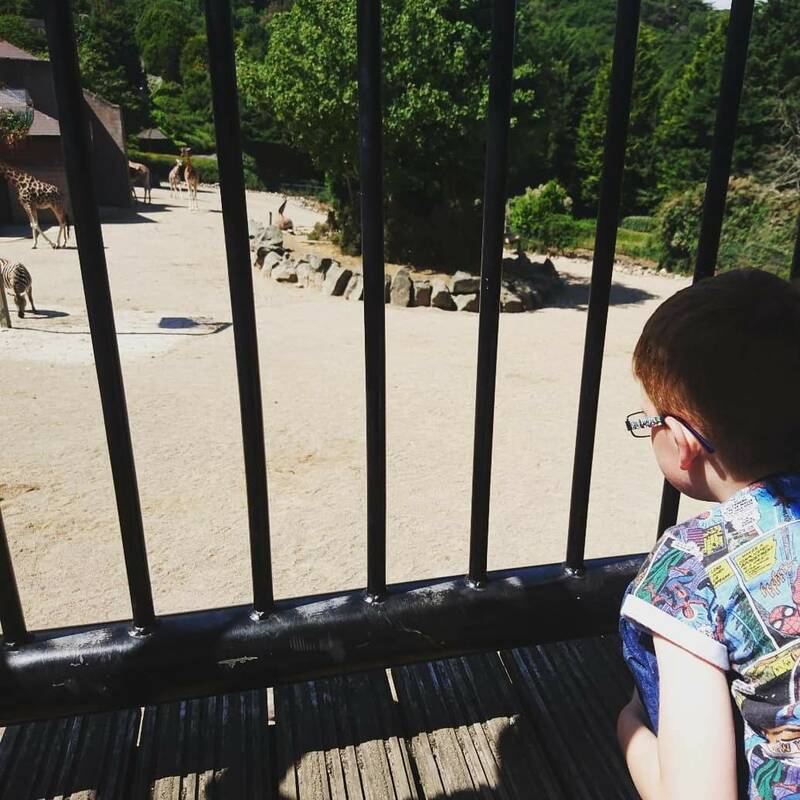 We'd found out I was pregnant when I visited the doctor with a bad kidney infection. With Scarlet I knew, right away at two weeks with nausea and implantation pains as well as ovulation pains which had never happened before. This time there really wasn't anything. The big sign that made me think I was pregnant was movement. Over Christmas I started to feel some movement. It wasn't big movements and at the start I was fobbing it off as digestion issues. Around this time I started to get a build up of acid and began cutting out fizzy drinks and acidic foods. The movements grew stronger through the week between Christmas and New Year. By the time January came I was almost sure I was pregnant and when we headed out shopping I grabbed a test. Of course the test came back positive and waiting down stairs I told Simon the news. Things moved pretty quickly. It was a Thursday night and come Friday afternoon we'd been to see the doctor at an emergency appointment. By her estimation I was around 20 weeks. Yes 20 weeks! Have you ever seen the show 'I didn't know I was pregnant'? Well I felt like one of the women on there right around that time. I was referred to the hospital with an urgent note to be seen as soon as they had space. Which only left us to deal with the shock of it all. After a few days we did start to come around the shock and we've been excited about our little surprise since. Life is going to change a whole lot and we won't have very much time before it all happens since we are over half way there already. However we already love our little surprise and we are looking forward to meeting them. As well as hopefully enjoying the final half of this pregnancy. We had quite the start to the year in January with some pretty unexpected news. In the first few days of January we found out that we are growing our family by one more set of little feet! Yes our little family of four will soon be growing into a family of five! As you can imagine it really has been quite the month for us all. We're very excited now the shock has worn off and Dylan is delighted to be having another little baby in our home. 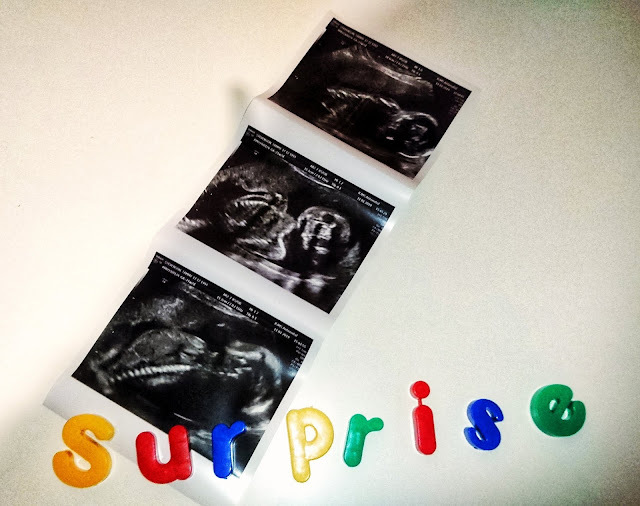 The surprises didn't quite stop there, we'll actually be meeting our third little baby in May this year so we've already passed the half way mark now! Over the next several months I will share weekly blog posts on our pregnancy journey. 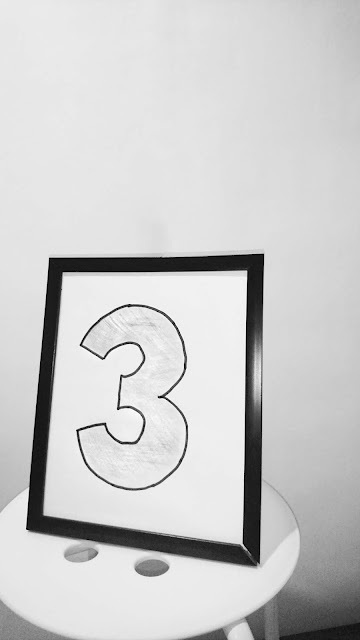 The next week or two will have another few posts about finding out about baby number three and a short post on how pregnancy has been so far.